featuring Big Quarters + Truthbetold (of The Tribe). featuring Eric Blair (of No Bird Sing). 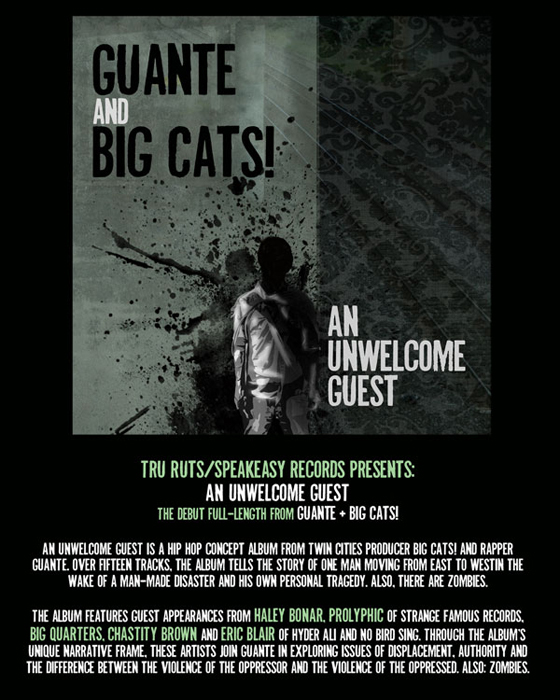 Tru Ruts/Speakeasy Records’ release of “An Unwelcome Guest,” the hip hop concept album from Twin Cities duo Guante & Big Cats, will be available exclusively through Strange Famous Records until its official release on January 12th, 2010. The indie-rap powerhouse, home to Sage Francis, B.Dolan, Prolyphic (who guests on the album) and other forward-thinking artists, will sell the album through its web-store at www.strangefamous.com. Following the pre-sales period, rising indie label, Tru Ruts, will make the album available in stores and other distribution outlets, however, ‘An Unwelcome Guest’ will continue to be available via digital download through Strange Famous Records. “An Unwelcome Guest” tells the story of one man fleeing the zombie apocalypse. It may sound original, but isn’t. The post-apocalypse concept has been done to death. What is original, however, is the way the duo plays with perspective, pushes the boundaries of hip hop narrative and somehow makes a love story about zombies, superheroes, displacement, violence, struggle, and America work. Big Cats’ beats could almost tell the story themselves—intensely cinematic, the production walks the line between crazy outer-space simmering funk and straight-up hip hop bangers. Guante, part of the championship 2009 National Poetry Slam St. Paul team, writes like a poet but doesn’t rap like one—the songs are hook-driven, dynamic and instantly quotable. Unapologetically political, unflinchingly descriptive and undeniably ambitious, the album is the duo’s first full-length collaboration. Listeners who buy “An Unwelcome Guest” through the Strange Famous store will receive a signed copy of the album, a free instrumental CD, a limited-edition sticker and a booklet by Guante containing song lyrics, commentary and pictures. Though the album’s official release (for record stores, ITunes and other retailers) will be in January, Twin Cities residents will have an exclusive opportunity to get it on Dec 12 at the Bedlam Theater during the special Twin Cities release party. 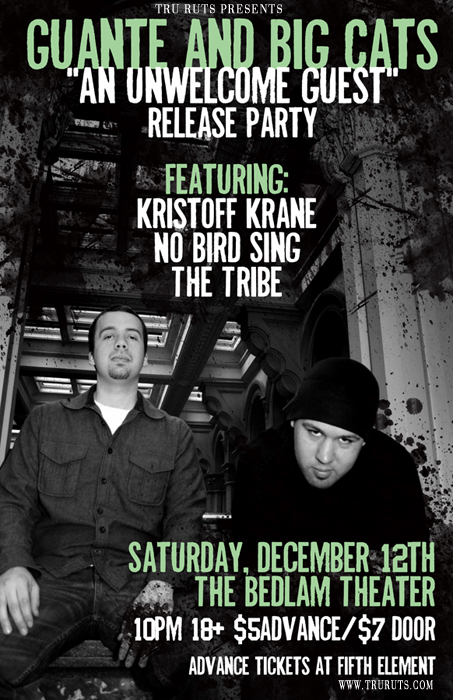 Joined by No Bird Sing, Kristoff Krane and the Tribe, and backed by a live band featuring members of Dragons Power Up, Guante & Big Cats will play the album in its entirety and sell physical copies of the album for one night only (10pm, 18+, $7). In anticipation of the new album from rapper Guante and producer Big Cats – the fellas threw together a quick video of punchlines and MPC to promote the album and their upcoming album release party which will also feature performances from No Bird Sing, The Tribe and Kristoff Kane. Very much looking forward to hearing the album. This would should be pretty dark. Look for An Unwelcome Guest dropping December 12th. Mark your calendars. 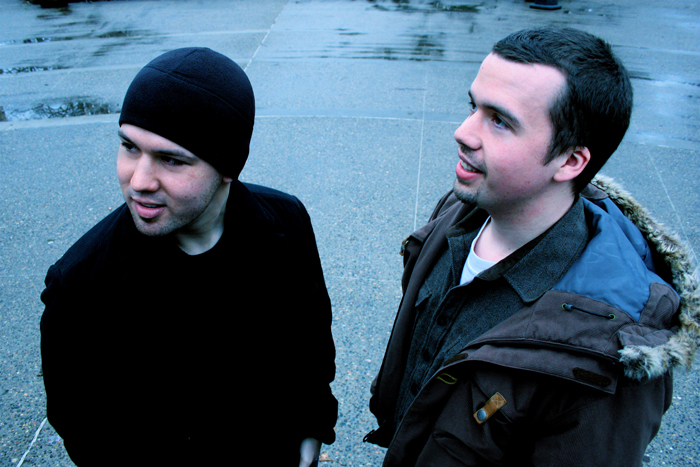 December 12, 2009 will be the Twin Cities release party for Guante + Big Cats’ debut LP, “AN UNWELCOME GUEST,” at the Bedlam Theater in Minneapolis. Supporting acts will include No Bird Sing, Kristoff Krane and The Tribe. The show will be 18+ and start at 10pm. Tickets are $5 in advance, and $7 at the door. Advance tickets can be purchased at Fifth Element. Bedlam Theatre, 1501 – 6th Street South, Minneapolis, MN 55454. 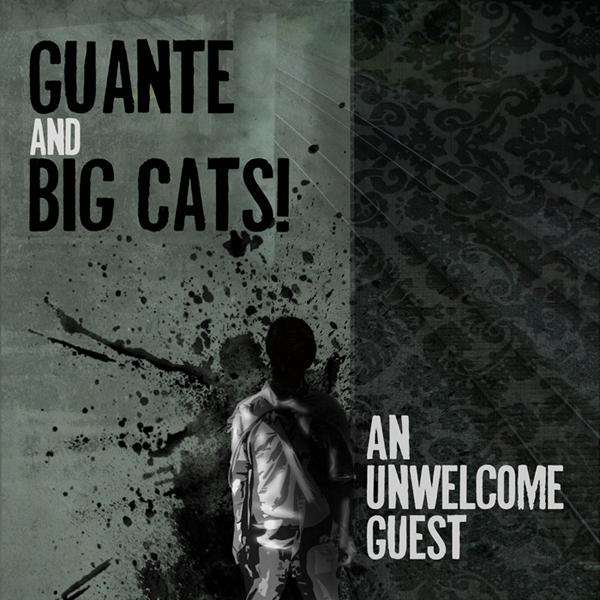 AN UNWELCOME GUEST is a hip hop concept album from Twin Cities producer BIG CATS and rapper GUANTE. Over fifteen tracks, the album tells the story of one man moving from east to west in the wake of a man-made disaster and his own personal tragedy. Also, there are zombies. The album features guest appearances from HALEY BONAR, PROLYPHIC (of Strange Famous Records), BIG QUARTERS, CHASTITY BROWN and ERIC BLAIR (of Hyder Ali and No Bird Sing). Through the album’s unique narrative frame, these artists join Guante in exploring issues of displacement, authority and the difference between the violence of the oppressor and the violence of the oppressed. Also: zombies. Stay tuned. Much more (including the first single, some exclusive video stuff and more announcements) coming soon. Blue Devil Productions is proud to present Guante and Big Cats! with The Tribe. The artists are scheduled to perform at the University of Wisconsin-Stout on Thursday, September 17, 2009 at 8 p.m. in the Underground, located on the lower level of the Memorial Student Center. 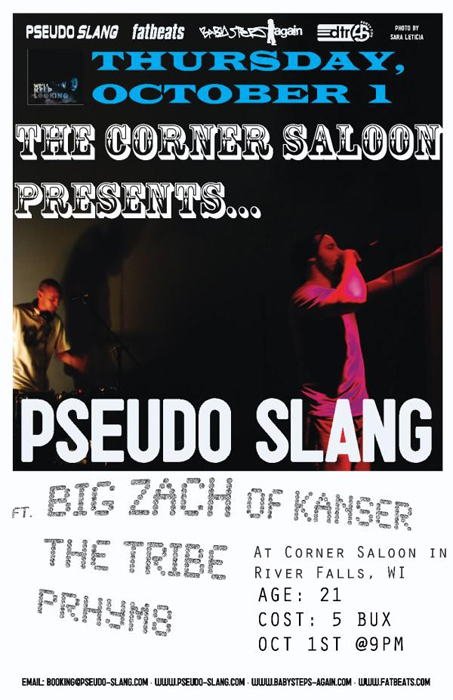 Producer, musician, and visual artist Big Cats!, will be performing with Minneapolis emcee/slam poet Guante. Taking advantage of a multitude of instruments and sounds, producer Big Cats! blends his atmospheric hip hop perfectly over whomever he is collaborating with. Drawing upon influences such as RJD2, Prefuse 73, or even Dosh, Big Cats! beats and production tastefully weave through instrumental passages while creating memorable hooks. Guante features insightful, socially conscious lyrics, expanding upon themes of political unrest and personal turmoil. His smooth delivery is not demanding of your attention, but that doesn’t mean that his words should fall on deaf ears. Minneapolis/Menomonie newcomers The Tribe, featuring members TruthBeTold and DJ Pete, are steadily gaining notoriety for their upbeat and intelligent hip hop. Relying heavily on the use of samples, DJ Pete’s production is a nod back to other eras of hip hop and rap. The equable style of TruthBeTold features lyrics that are both discerning and honest. Still performing off their March EP release, Supply and Demand, the group demonstrates a more polished and though-out effort that will certainly gain more attention in the local hip hop scene. The future of Twin Cities hip hop has worthy disciples in The Tribe. This event is sponsored by Blue Devil Productions of the University of Wisconsin-Stout and is FREE to all. Go to bdp.uwstout.edu for more information. FROM CULTUREBULLY.COM: “Life ain’t short, it’s just a lot of people waste it.” This could simply be coincidental, but it’s fitting that the tracks on Guante and Big Cats!’s Start a Fire EP have been edited and cut down to their most basic, wasting nothing in the process. It’s not that Big Cats!’s beats are any less flowing or robust than normal, or that Guante’s lyrics are any less poignant—the EP simply takes the duo’s abilities and projects them at their most concentrated. One shining example of this is the remix to “One of These Mornings;” the track that the previously mentioned quote comes from. Despite coming in at nearly a minute shorter than the original, nothing feels lost between it and the remix. If anything, the flute-based beat of the remix adds a fresh complexity to the track that allows it freedom while shedding the excess. The success that the original version of this track had really caught me off guard. The Current picked it up and was playing it every day this past Fall, and everyone was telling me how it was their favorite song on “El Guante’s Haunted Studio Apartment.” I liked it a lot as a recorded track (Eugene, OR producer G-Force put together a beautiful beat), but wanted a more lively, uptempo version to play at shows. Big Cats! delivered. One note about the lyrics: I think a lot of people hear this as a “slice of life” song, a song about me walking around and talking to random people. The song is about DEATH. The sample in the original (and the hook in the remix), “one of these mornings, you’re going to rise up singing,” is referring to the fact that someday you’re going to die. It’s from Porgy and Bess, “Summertime.” Again, I like this song a lot, but the live version with our band is on another level. In collaboration with Tru Ruts, Culture Bully is proud to present Guante & Big Cats!’s release show for the duo’s new Start a Fire EP. The duo will be joined by Chastity Brown, See More Perspective, the Tribe and Chantz. The show will be at the Nomad World Pub on the West Bank Saturday, May 9 @ 9:00 p.m. Entry is only $5.